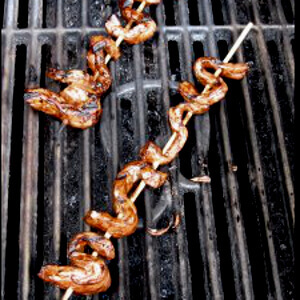 Transform a beef rib eye or sirloin steak into a batch of teriyaki steak skewers. Perfect for an appetizer, or just for an easy snack, these flavorful beef treats sure hit the spot! I prefer to use a nice rib eye steak that has plenty of marbling for juiciness and flavor. It's sliced, seasoned, and seared on the grill. Very easy and very tasty, too. Marinate the beef strips in teriyaki sauce for one hour. If you plan ahead, soak 'em overnight. The meat will have a lot more flavor that way. Arrange the steak strips on the skewers. Grill over high heat for just a minute or two on each side. Because of the small size of the beef strips, it's really easy to overcook them, making them dry and tough. Enjoy these teriyaki steak appetizers anytime. They can be cooked easily in a hot skillet on the stove top, too, so they're great for midnight snacks.